Leading off today: Apologies for not getting a recap of Saturday basketball action onto the website Sunday. I found myself oversubscribed with other tasks throughout the day and ran out of steam after a lively back-and-forth with some colleagues on Twitter. Disaster averted: The Mount Vernon boys basketball team overcame a meltdown of near-historic proportions Sunday in the Section 1 Class AA final, surrendering all of a 26-point lead in the third quarter to Scarsdale, giving up a tying 3-pointer at the end of the regulation, and then recovering to win 67-61 in overtime. The victory gave the Knights their 16th championship in 19 seasons. "It never matters how many we've won in the past," said senior Noah Morgan, who had 11 points and 16 rebounds. "Every year we come out and we fight to get here and win here. Today, we did it." Said Knights coach Bob Cimmino: "It was three separate games; it was our half, their half and a little bit of overtime. I'm just happy the fellas did what they did at the end so I could continue teaching at Mount Vernon High School. Because I don't think I would be going back if we didn't finish this one." Scarsdale's Max Bosco scored 28 of his 35 points in the second half, erasing a 44-18 deficit with 4:37 remaining in the third quarter to force overtime. Will Hoffman's 3-pointer with :02.7 left sent the game to OT. In OT, Mount Vernon quickly went ahead by four and finished the task. "It almost felt like we survived at the end," Mount Vernon senior Noah Morgan said. "Scarsdale played a helluva game to come back like that and tie it up." This rally succeeded: Down 12 points early in the fourth quarter, Poughkeepsie put on a big rally capped by Davontrey Thomas' two free throws with :15 left to tie, and the Pioneers went on to beat Goshen 100-92 in OT to win the Section 9 Class A championship. Marvin Lunsford and Antawone West led Poughkeepsie scorers with 21 and 19 points, respectively, and the Pioneers finished with five scorers in double figures. Seven straight for Ossining: Ossining avenged its first girls basketball loss to a Section 1 opponent in nearly six years by winning its seventh consecutive Class AA sectional championship Sunday. The Pride, who lost to Albertus Magnus on Feb. 1, knocked off the Lady Falcons 80-77. Senior Andra Espinoza-Hunter (32 points, 11 rebounds) swatted away a potential game-tying shot just before the final buzzer to seal the win. Sophomore forward Kailah Harris finished with 27 points and 15 rebounds for Ossining, which will face undefeated Section 9 champion Monroe-Woodbury in the state tournament's opening round. More girls basketball: Watertown Immaculate Heart Central earned the Section 3 girls Class D basketball title with a 52-48 win vs. Sackets Harbor. The bad news is the road doesn't get an easier. 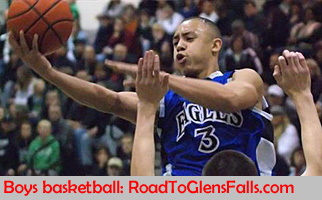 The Cavaliers next meet two-time defending NYSPHSAA champion Heuvelton in the state quarterfinals. Heuvelton won their regular-season meeting 68-37. Seventh-grade point guard Jackie Piddock led the way with 25 points. Young stars: Eighth-graders came up big in the Section 6 girls Class A finals. Six-foot-4 Amari DeBerry of Williamsville South scored 21 points and stood out on defense in helping to defeat Hamburg 58-50 in the A-1 title game. "She's the best-kept secret in Western New York," Williamsville South coach Kristen Dolan said. "Other people outside the area have now heard of her. She's so young, so talented. Now it's just a matter of keeping her in the game." Emma Klein of Amherst helped down Olean 70-50 in A-2 with 23 points to go with Claire Wanzer's 18. CHSAA boys: Archbishop Stepinac overcame a sluggish start and beat Christ the King 78-67 with the help of a 17-point run in the CHSAA Class AA quarterfinals at Fordham. R.J. Davis finished with a game-high 23 points (including all 12 of his free throws) and Jorden Means scored 22. Kofi Cockburn scored 22 for Christ the King. • Archbishop Molloy wore down All Hallows and went on to a 78-59 win as Moses Brown played through pain in his right shoulder to score a game-high 28 points with 14 rebounds. Khalid Moore chipped in with 21 points. "We understood that this could possibly be our last game if we don't play like we are supposed to play," Brown said. "We just turned it up." The Stanners advance to the Intersectional semifinals vs. Stepinac on Wednesday at St. John's University. • Cardinal Hayes junior Tyrese Williams posted 18 points and six in a 66-54 win over Mount St. Michael to advance to the semifinals against Bishop Loughlin. Four players scored in double figures as the Cardinals defeated rivals Mount for the third time this season. "I just saw shots were falling and when shots are falling, everyone thinks you're a good coach," Hayes coach Joe Lods joked. • Bishop Loughlin shot 75 percent in the first half and went on to an 87-70 victory over Iona Prep. Markquis Nowell had 22 points, 8 assists and 5 rebounds along with backcourt mate Keith Williams shooting 8-for-10 from the field and posting 20 points. Tyrese Gaffney shot 9-for-11 on his way to 21 points. NYC surprise: Kyle Harding scored 21 points as 11th-seeded Thomas Jefferson blew out No. 3 John Bowne 77-49 in the PSAL boys Class AA quarterfinals. Malachi Faison chipped in with 19 points. NYSPHSAA bowling, Day 2: Nick Perrone of Walter Panas opened with games of 233 and 279 en route to a six-game block of 1,392 to top the boys field in the individual competition at Gates Bowl near Rochester. Zach Bobbett of Union Springs took second place with a 1,341 pinfall to lead Section 4 to team honors. Jenna Lemke of Bethlehem ran away with the girls crown with a 1,366 set that included a 279 game. Victoria Pacacha of John Jay in Wappingers Falls was the runner-up with a 1,269 series. Section 2 won the girls team scoring. CHSAA hockey: St. Joe's repeated as state Catholic High School Athletic Association boys hockey champion with a 5-2 win over St. Anthony's, running its season-ending unbeaten streak to 22 games. Senior Jeremy Ienco scored twice for St. Joe's, which rallied from a 2-1 deficit. Seniors Mark Gilbert and Luke Pierce and junior Spencer Frome added goals in the win. Two days, two records: Rush-Henrietta senior Sammy Watson smashed her day-old national high school record in the 1,000 meters while finishing fourth at the USA Track & Field Indoor Championships in Albuquerque, N.M.
Watson finished in 2:40.72 to clobber her Saturday qualifying mark of 2:43.18. She set national high school records for 600 and 800 meters earlier in the season. Noteworthy Saturday hoops: In the Section 2 boys Class A final, Lansingburgh senior star Jahidi Wallace went coast to coast to score at the overtime buzzer for a 64-62 win over Averill Park. AP had tied on a Noah Yearsley bucket with :05 to go. Lansingburgh hadn't won a sectional title since 1967. • Brendan McGuire scored five of his team-high 13 points from the line in the fourth quarter to lift Chaminade to a 59-56 win over two-time defending Federation boys Class A champ Canisius in the CHSAA semifinals. The Flyers advance to Saturday's state championship against Monsignor Farrell. • In the girls CHSAA Brooklyn/Queens Class AA title game, Vanerlie Valcourt's layup with :04.4 left carried The Mary Louis Academy over Christ the King 66-64. McDonald's All-American and Notre Dame recruit Danielle Patterson finished with a game-high 24 points.